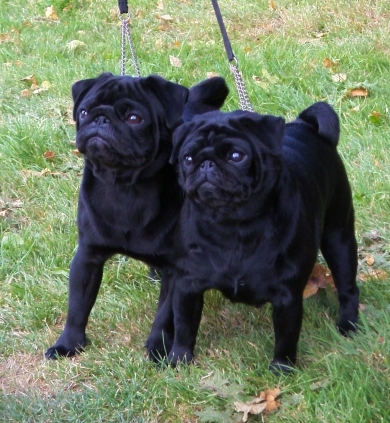 ONE OF THE BLACK PUGS OF THE PAST OWNED BY MY GREAT GRANDMA, CH LITTLE GEISHA SHE WON MANY BIS AWARDS AT THE PUG CLUBS, THEN I THINK IT WAS ACTUALLY BASED IN LIVERPOOL NOT LONDON AS THE PRESENT DAY CLUB IS. 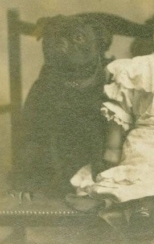 AT THAT TIME A CC OR A BIS OR BEST BLACK PUG IN SHOW, RECEIVED A STUNNING SOLID SILVER MEDAL ENGRAVED WITH ALL THE DETAILS OF THE PRESTIGIOUS WIN. THESE WERE USUALLY MADE INTO A COLLAR WHICH THE PUGS WORE: I PRESUME TO BE PHOTAGRAPHED IN. I HAVE MANY OF THESE PHOTOGRAPHS AND THE COLLAR BUT UNFORTUNATELY THE SCANNER IS NOT WORKING AND THE PICTURES VERY FRAGILE...SO IN TIME HOPEFULLY I WILL COPY THE PICTURES TO MY WEBSITE.